By Caz | November 6, 2018 | This post may contain affiliate links, which means we may receive a small commission, at no cost to you, if you make a purchase through a link. Read our Disclosure. 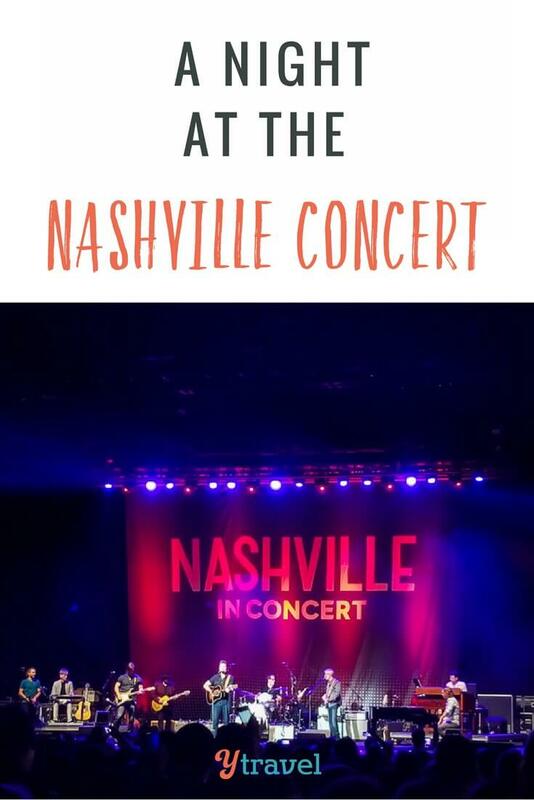 On the way to the Nashville concert, I couldn’t stop thinking about interviewing the artists. You know in your wildest dreams where you meet the stars of your favorite show and you get the chance to ask them questions you’re dying to know. Were you a musician before you got the part or did your role in the show lead you down the musical path? Do you get to write your own songs? How similar are you to your characters? Did you ever in your wildest dreams envisions this future? I’m curious to see how life unfolds for people. The more I investigate, the more I notice the dance between self-driven and something much stronger believing in and guiding us. It led me to create my 30 Days to Money Mindfulness program and I am in the middle of guiding my new group of participants to recognize how this works. One thing I suggest to them is to study the journey others have taken. What are the similarities? What are the guiding principles of their success? If we study, absorb, reflect and connect the dots of others, we are far more able to let the dots connect in our own life. 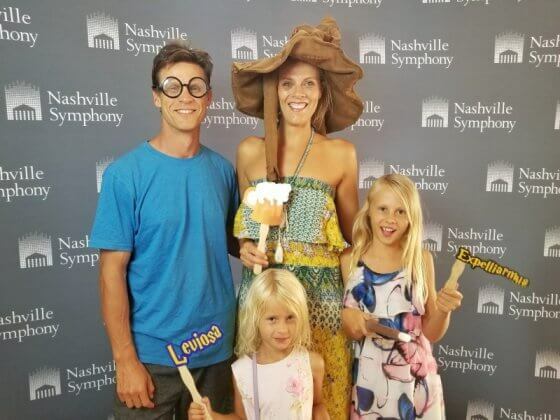 I knew I was not on the media list to get behind the scenes of the Nashville Concert to ask the stars of the hit TV show Nashville these questions. But, I imagined chatting to them about it and remained open to somehow find the answers. 18 months ago, our friend Mel stayed with us in Burleigh. She spoke about the hit TV series Nashville and about how we should watch it. We were a bit ho hum as we weren’t really big TV fans. But, we watched it and fell into the Netflix binge watching trap. Nashville became our release from a hectic week on a Friday afternoon. We got lost in the show and the music. I fell in love with all the characters and the style of music on the show. 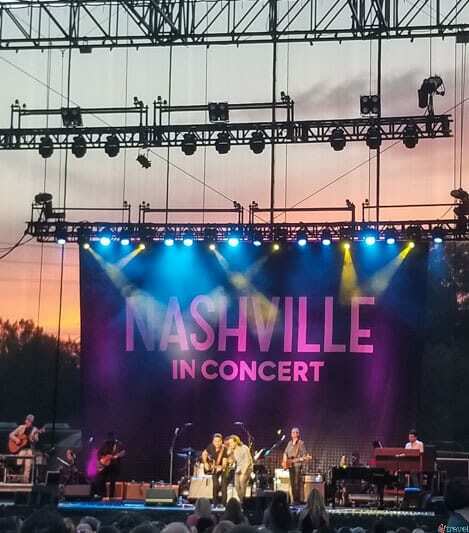 It fueled an intense desire for us to get back to Nashville and that desire orchestrated things in our life so that it became one of the first destinations on our USA road trip. Meeting Deacon Clayboure, the most loved fictional reformed alcoholic on the planet, became top of my bucket list. We missed him by a couple of nights at both the Grand Ole Opry and The Bluebird Café. 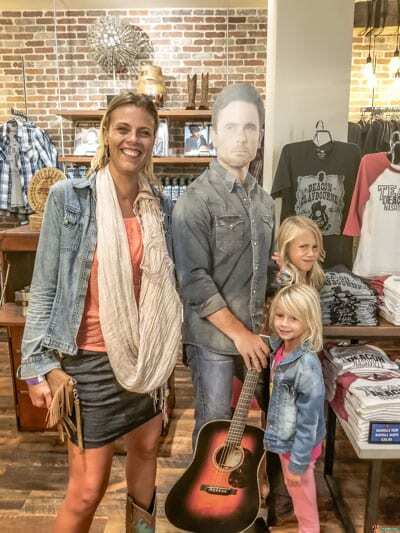 But, saw him on our very last day in the merch store in the Wildhorse Saloon. Just check out Kalyra’s face after I insisted we have a meet and greet photo!! 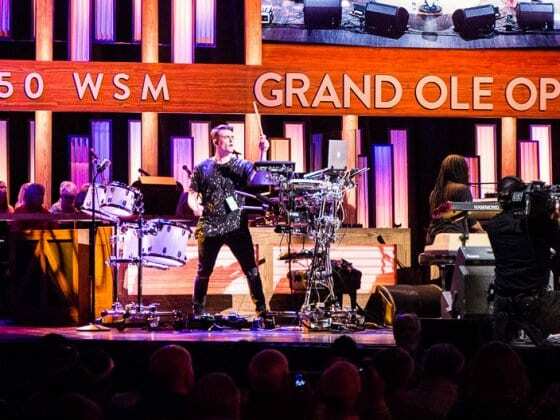 When we saw Will Lexington (in real life Chris Carmack) was billed to play at the Opry, we bought tickets to see him and was then introduced to Striking Matches, a duet who have written 9 hits from the TV show. And we saw Maddie (in real life Stella Maisy) in Fido Café in Nashville. Craig insisted I follow her into the bathroom to take my chance to say hi. I politely declined bathroom stalking, intent to discreetly stare from a few tables away. Savannah did offer “I’ll go up and say hello to her,” sliding off the table with the camera in one hand before I reached out with mine to hold her back. Last week, the Bluebird Café featured our article on their Facebook page. Mel and I chatted about where all this began and if it wasn’t for her, we’d never have been featured by such an iconic and much loved music venue. That’s the twists and turns and surprises of life. And here I was now on the way to see Nashville in concert at the Red Hat Amphitheater in Raleigh. I follow Charles Esten and Claire Bowen on Instagram and saw they were going on a Nashville tour. On August 2nd they’d be coming to Raleigh. We organized for a friend to mind the girls and off we went. The Red Hat Amphitheatre is not an outdoor venue we have experienced it before. They were building it when we left Raleigh back in 2010. The Red Hat is in the middle of downtown Raleigh right next to the convention centre, which has a gorgeous picture of a tree as the backdrop that lights up at night. You have views of the city skyline, the sun sets behind the stage and the moon rises to greet the artists as they close out the day. And if you’re lucky, you may get the city soundtrack enhancing the performance like we did with sirens whizzing by and the trains rolling and tooting their horns behind the stage. And completed the famous Johnny Cash song Folsom Prison Blues. As a major Man in Black fan, I roared with cheers as did the entire crowd. Only a true musician could do something so impromptu with his band so flawlessly. The show started off a little disappointing for us with an announcement that Claire Bowen (Scarlet from the show) would not be performing as she was sick. Claire is Australian, and we love her music, so we were disappointed to not be able to hear it and show our support for an Aussie star! 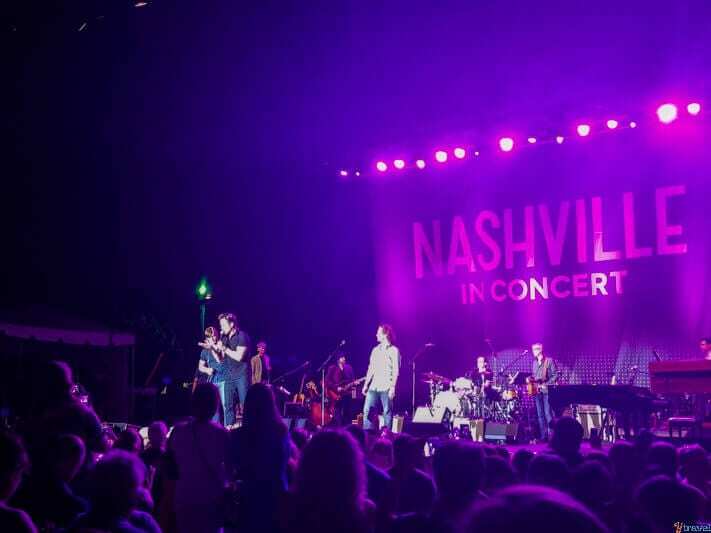 But Chris Carmack, Charles Esten and Jonathan Jackson stepped up to deliver a great evening. Without even interviewing them my questions were answered. Obviously, you can tell from the Nashville TV show that they can all sing and have talent. But it’s not until I saw them play that I realized their talent was what got them the part and it’s something that came long before the Nashville series was created. What was amazing to see was the joy they had performing. It’s not something you can fake, it’s something you were born with. 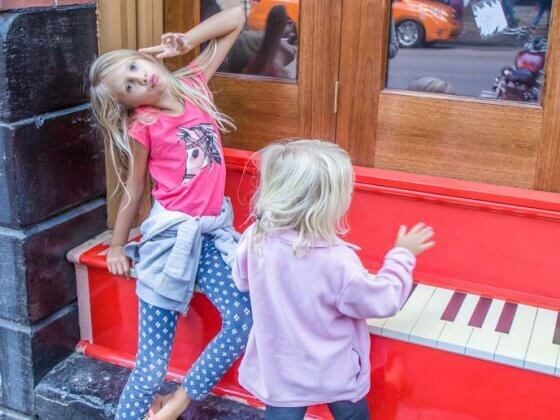 Music is their spirit and it came through in their performance. I was mesmerized by Jonathan Jackson, his voice was incredible and so versatile. He had the rock grunge sound, then changed it up to sound just like Elvis with Unchained Melody and then a powerful cover of U2’s Rescue Me. The crowd were on their feet after the last note on that song. They played their own music, songs from the show and some of their favorite tunes from other artists. They told us stories of Nashville and their own careers before the show. All of them have been playing music since they were young and spent years playing the college band circuit when they were younger. Chris Carmack tore up the saxophone and guitar and both Jonathan and Charles played the piano. 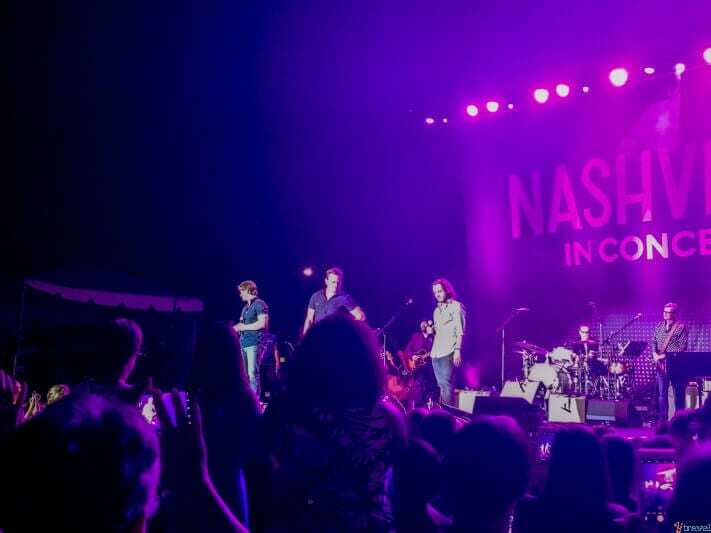 They had vibrant personalities were warm and friendly and so grateful for the Nashies – the Nashville fans who they acknowledged as helping them make their dreams come true. They spoke so highly of each other and you could tell their was a kinship there with the whole Nashville family from the stars to the songwriters and the people behind the set. These people lived and breathed music, you could tell. I’m sure they have spent years showing up for the music and fighting the fight to be seen and heard and shared. And then one day a show comes along to help you be seen and give you a platform to share your music. 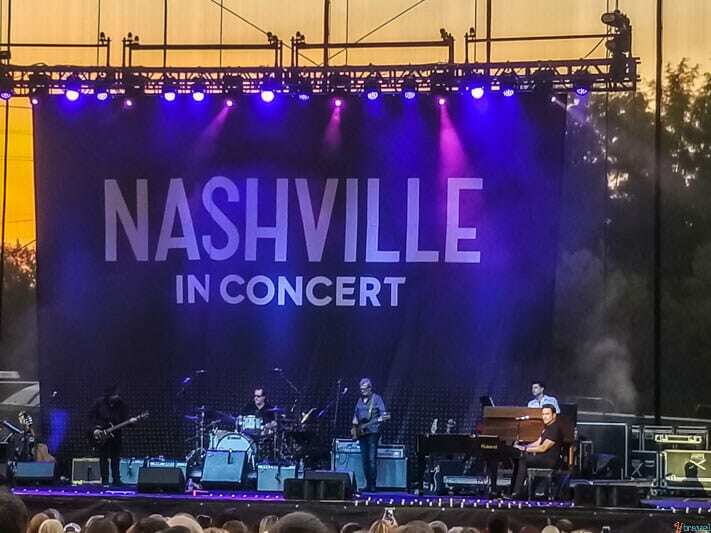 I didn’t hear as many of the songs from Nashville as I was hoping or expecting, but what I got instead were performances from artists – the real people, not their characters, even though their characters style is so like the real people. I loved discovering that yes, they were the ones that shaped their characters on the show Nashville, not the other way round. Stories like this remind me of possibilities. I’m sure that Charles Esten (Deacon Claybourne in Nashville), when he was touring colleges with his college band many years go, never would have dreamed that one day he’d produce 54 singles in a road, write and perform music for a hit TV show, become one of its much loved stars, tour the world, and host the CMA awards. I’m sure he just showed up for his passion and dreams, did the daily hard slog and let life take him on this wild ride. I’ve been sharing this idea lately in my Money Mindfulness course – how if you show up everyday for your dreams and get out of your own way, a dreamy flowy river can take you to places you never even had the dreaming capacity to conjure up. 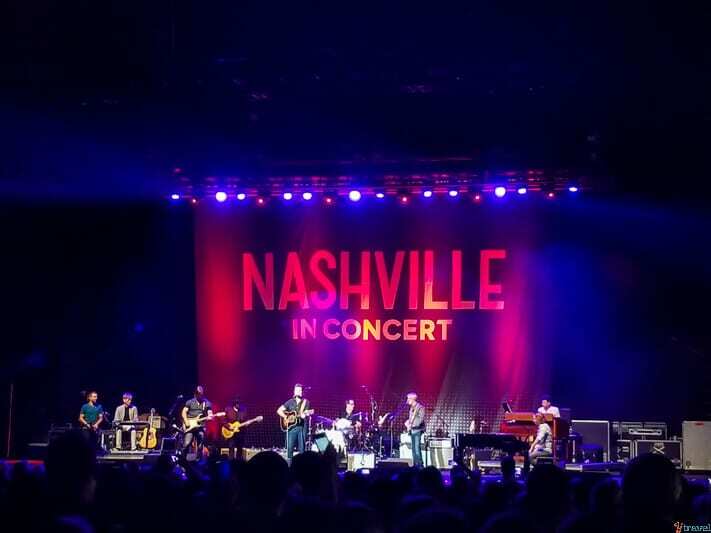 They ended the Nashville concert with one of my favorite songs, not just from the TV show, but one I play all the time as a reminder of the life I want to create and my purpose for living each day. They called us all to huddle close to the stage and dropped their instruments to sing, Life that is good. As a travel lover I’m sure you can relate to this message of moments and memories over possessions. All that we want is to live a life that is good. Keep working with that intention every day and you juts never know on what stage you’ll be singing in a few years time. Be amazed by that journey. I’ll just leave it here for you to listen to now. Want to find out what other America Unplugged experiences we’re having in North Carolina? Find out about our iconic night at the Durham Bulls baseball game and a camping, tubing and knee boarding fun at Kerr Lake, my favorite Lake Lure, the incredible Biltmore Estate, and exploring Johnston County. Great concert, looks really fun there. Do you ever pass through Philadelphia by chance?